Forget everything you thought you knew about a dream staycation and head to Living Asia Resort and Spa Lombok to witness the finest hospitality. Spectacular coastlines, majestic peaks, and a vibrant countryside make Living Asia more than just a luxury paradise. Located along the beach, the resort stands as a mesmerizing spectacle in the Indonesian island. Not just gorgeous views, Living Asia offers luxury, pleasure and everything in between to the holidaymaker. 3 Nights Garden View Room - 46 sq.m. 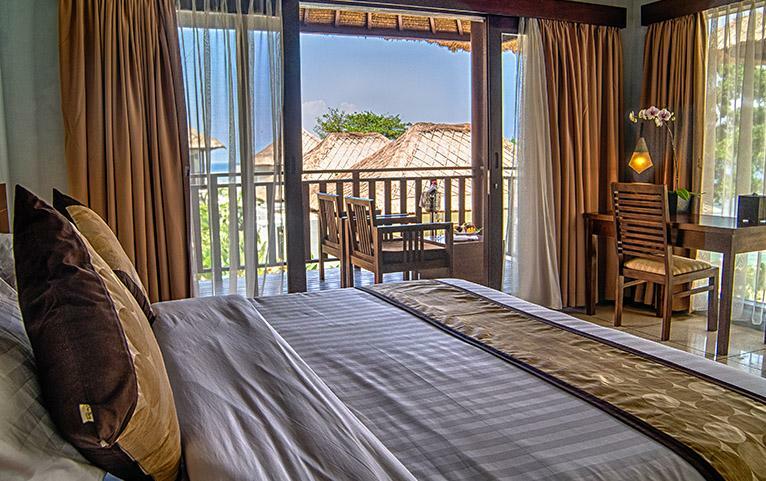 3 Nights Partial Ocean View Room - 46 sq.m. 5 Nights Garden View Room - 46 sq.m. 3 Nights Private Pool Villa - 100 sq.m. 5 Nights Partial Ocean View Room - 46 sq.m. 5 Nights Private Pool Villa - 100 sq.m. Lombok, also called ‘the unspoilt Bali’, is much more than a stunning Indonesian island. The treasure trove is nestled between captivating panoramic views, pristine waters, majestic mountains and spectacular sunsets. Those looking to vacation in here can choose their pick from a plethora of activities such as snorkelling, sipping a drink at the beach parties, or cycling to the nearby markets. No wonder Lombok stands out as a hot-spot destination for all travel enthusiasts. Living Asia Resort & Spa Lombok features 66 rooms, top-notch amenities and comfortable rooms overlooking exquisite landscapes. Its vacation-friendly perks, such as shuttle services, outdoor pool and romantic meals make it a suitable destination for honeymooners, families and solo trippers alike. Garden View Room - 46 sq.m: The extravagant room leaves you with a sense of calm each time you step inside. Spanning across two-storey buildings and overlooking lush greens, the Garden View Room has much to offer. 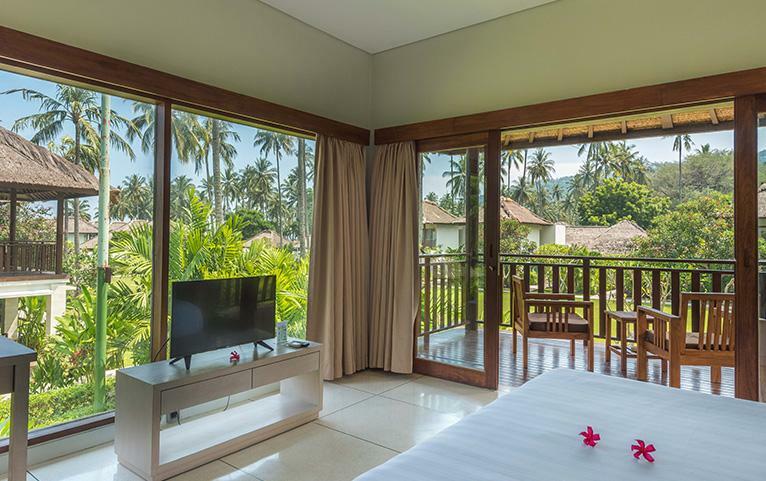 A private balcony, a bathroom to yourself and uninterrupted views make for an exclusive space on the tropical island. Partial Ocean View Room - 46 sq.m: The Partial Ocean View Room is designed to pamper you with unmatched expanses and sparkling oceanic views. Located close to the hotel bar and restaurant, and equipped with a private balcony and coffee table, the room is a perfect blend of intuitive comfort and modern amenities. 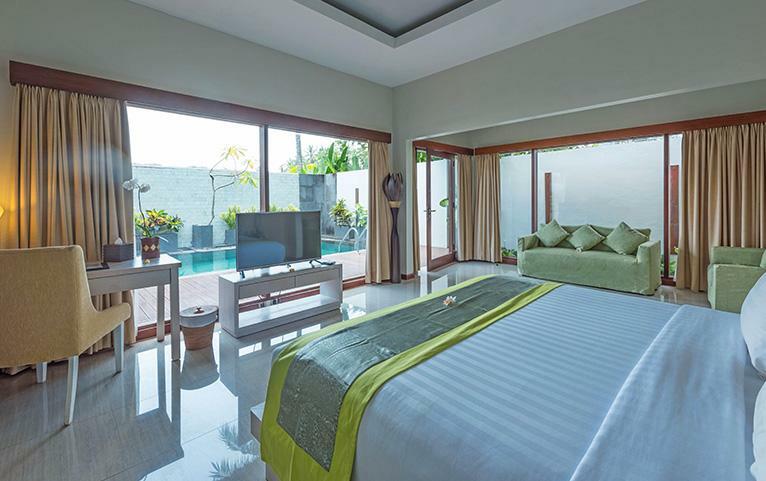 Private Pool Villa - 100 sq.m: Make the most of your self-indulgence with a private pool and terrace at the Private Pool Villa. Enjoy a laid-back afternoon in the king size bed or watch the sun go down - this luxurious space is especially ideal for honeymooners and is an expression of your everyday life. Extra Guest Policy: Where applicable, an extra adult can stay at a surcharge of USD 30 per night, with an extra bed and breakfast, payable directly at the resort. Child Policy: A child aged between 0-5 years may stay free of charge using existing bedding. Where applicable, a child aged between 6-12 years may stay at a surcharge of USD 30 per night, which includes an extra bed and breakfast, payable directly at the resort. Airport Transfers: Just to add a little more comfort to your stay, the resort arranges for your airport transfers. A one-way airport pick-up is part of your FABgetaways package. Dining: Give your holiday a taste of Indonesia and enjoy delightful meals and beverages by the beach at Malaka Restaurant and Beach Bar. Spa: The Camplung Spa offers an array of rejuvenating therapies. Infinity pool: Get Insta-worthy photos at the resort’s over-sized infinity pool. The nearest airport is Lombok International Airport located about 50 km from the resort. The airport receives flights from Bali, Jakarta amongst other Indonesian destinations. The airport also has connectivity with Singapore and Kuala Lumpur. Alternatively, one can take the fast boat that takes around 2 hours from Bali to Lombok.